Good news on another win! I’m pleased to report that I’ve just been nominated for four TORI Awards (TORI stands for Toast of the Resume Industry). Nominations were for Best Executive Resume, Best Graduate Resume, Best Creative Resume and Best Technical Resume. The Awards are announced in Career Directors Conference Awards Ceremony in October. 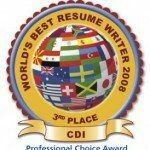 World Resume Writing Contest: Place Winner!